The 0-2 away victory for Schalke in Leverkusen gave the Royal Blues back to back victories and 10 points in their last six games, the same as Bayer, who have now lost 2 of 3. With Dortmund only drawing at home with Augsburg, Frankfurt and Leipzig failing to win, Schalke have climbed back into third place for the first time since February 1st. The hosts Bayer 04 entered the game with two notable absentees in Jonathan Tah (infection) and Lars Bender both missing the last couple games.It meant that Tin Jedvaj would get the start at RB and Panagiotis Retsos would once again fill in at CB alongside Sven Bender at CB and Wendell at LB, so in essence the same back four as against HSV last weekend. In fact with the Kohr, Aranguiz double pivot and the Havertz, Brandt, Bailey trio behind Kevin Volland, it was the same exact 4-2-3-1. Havertz was able to man-mark Max Meyer out of the game, with the Schalke deep lying playmaker attempting just 22 passes in his 49 minutes on the pitch. Meanwhile it would be up to Bailey and Brandt to occasionally press the Schalke CBs, but mostly focus on the forward runs of the wing backs Oczipka and Caligiuri. Schalke’s now customary compact and well-structured 3-4-1-2 (see image above) also had mostly the same faces as in the recent matches against Bayern and Hoffenheim: the three chain was anchored by Naldo alongside the LCB Nastasic and the RCB Kehrer. In midfield, Goretzka and Max Meyer started inside, with Bastian Oczipka returning to the starting lineup at LWB, while Daniel Caligiuri, who in the last few games filled in for Oczipka on the left, moved back to his usual right side. Up front, behind the Embolo, Burgstaller duo, Franco di Santo was once again tasked with pressing the CBs and thereby disrupting the B04 buildup, specifically focusing on the vertical passing of Charles Aranguiz and the ball-carrying\counter attacking ability of Dominik Kohr. Those two were just two of the five (!!!) Leverkusen players in the top 25 in XG Buildup, a metric that looks at the total XG of all involved possessions without key passes and shots. The other three culprits were Kai Havertz, who would be involved in man to man battle with Max Meyer in the first half and the pacey-dribbling wingers Bailey and Brandt. In Domenico Tedesco’s estimation cutting off the supply to that trio with a strong and consistent press would be crucial for Schalke’s chances. As the away team, Schalke’s initial strategy was to concede possession and utilise a couple pressing triggers (long straight line passes by CBs, backwards passes by wingbacks and or CMs) to disrupt the Leverkusen buildup and deny central access to their excellent attacking players (Brandt\Bailey\Havertz) mentioned above. The orientation of the Schalke front three was such that they forced Leverkusen’s CBs and GK to pass the ball wide, where wing backs Oczipka and Caligiuri would step very high up to press the Bayer fullbacks. It definitely worked as Leverkusen’s goalkeeper Bernd Leno was extremely involved with 26 passes in the first 38 minutes and just 20 in the remaining 52 minutes! As you can also see from the pics, Leno was the target of several back passes by his CBs, and he racked up 48 touches in the first 38 minutes and just 33 in the remainder of the game. Pana Retsos’ ball playing ability was certainly put to the test, as he attempted 30 passes in the first 31 minutes, and the 19-year-old Greek CB passed with flying colors by completing 26 of them! Prior to the goal, Leverkusen had enjoyed 66% possession, but were only able to get one shot off, a theme that would continue all afternoon. Kevin Volland was particularly ineffective, losing 11 balls in the first 30 minutes or so. Between minutes 20-24 Leverkusen did manage a couple of promising attacks, with Leon Bailey’s rocket from a corner sizzling past the goal in the 20th. Still, it was Schalke who could’ve made it 0-2 had Bernd Leno not pulled off a great save against Leon Goretzka after a set piece in the 29th minute. Goretzka would earn a crucial yellow card against Dominik Kohr in the 32nd, and the Leverkusen midfielder’s dangerous tackle in the 38th vs Breel Embolo, who was coming back deep into his own half to win a duel and pass the ball backwards, got him a second yellow! The game got tense and while Thilo Kehrer escaped a yellow for his foul on Bailey for a similar tactical foul, Guido Burgstaller would get his 5th yellow of the season for a foul on Aranguiz, who lead all players with 5 fouls suffered. 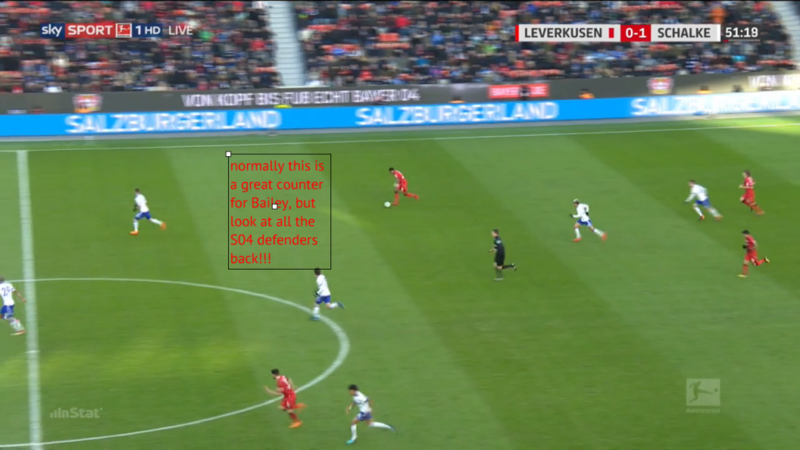 Despite losing Kohr from the double pivot, Herrlich didn’t make a huge adjustment, moving Kai Havertz a little deeper when Bayer were without the ball, into what looked like a 4-2-3. As a few people pointed out it was Tedesco who actually made the first adjustment by taking off Max Meyer for Benjamin Stambouli, thus appearing to sacrifice the short passing\playmaking of Meyer for the rugged tackling\ long balls of the underrated Stambouli. While on the surface this move made little sense, when you consider that Meyer was A) marked out of the game and B) was needless in a second half where Schalke because of being up a goal vs ten men, would either press, counterpress and counter-attack rather than try to build up, it makes a ton of sense. Finally, without Kohr, whose propensity to get involved in challenges earned him the nickname HARDKOHR, S04 could use Stambouli’s strength in duels and ability to play long-balls to win second balls either in midfield or higher. Leverkusen’s stubbornness to adjust should have cost them a goal were it for some better decision-making\finishing by the Schalke front three and it wasn’t until Harit earned a yellow card against Aranguiz in the 71st minute that Herrlich decided to change. Stefan Kießling came on for Julian Brandt and for the first since November (!!) to act as a target man. Karim Bellarabi was brought on for Jedvaj, but Bayer actually went to a 3 chain in defense, with Wendell moving to LCB in a 3-4-2 with Alario (on for Volland in the 62nd) as the other forward. Although Bayer failed to record a shot in between minutes 71-82, it appeared to have worked defensively…. That is until the 82nd minute, when off a Leverkusen set piece, another one of Harit’s brilliant runs set up Embolo, who evaded Bailey’s last-ditch tackle and tried an audacious chip over Leno, who made a fabulous save. A couple minutes later another S04 counter looked to have been dealt with as Embolo’s poor touch allowed Bender to intervene and pass to Retsos, who had the ball caught up underneath him and allowed the fore-checking Nabil Bentaleb (on for Goretzka in the 66th minute) to play in Embolo vs Leno. Retsos would make up some of the ground but could only give away a penalty that Bentaleb converted for 0-2. By allowing Bayer just 11 counter opportunities (season average is 17 per match) and a total of 3 key passes, Schalke gave Leverkusen no chance of scoring. That’s how you keep the Bundesliga’s third best attack, in goals and XG, to a season-low 0.42 XG and no goals scored!